Trick or treating might be over for another year but there are still plenty of spooky goodies on offer from Mr Smith Casino thanks to their £20,000 Halloween Blood Bank giveaway. It’s possible to win more than 1 prize from the Halloween Blood Bank promotion – all prizes are in cash and don’t come with any wagering requirements. Both of the qualifying slots come from Yggdrasil Gaming. First up is Wolf Hunters which is a classic slice of Gothic horror. Played using a 5 reel, 20 payline game engine, it comes with Victorian era design and some top extras. Keep a special eye out for the werewolf symbol which can award respins. There’s also a free spins round which can be triggered in 3 different ways. Once active, collecting werewolf hunter or huntress symbols can deliver even more free spins and expanding wilds. This traditional horror-themed slot impresses both visually and in terms of gameplay. If you fancy something a little more unusual then Dark Vortex should appeal. The base game action takes place using a 5 reel, 243 ways to win machine. Land the Vortex symbol to open up the Vortex reels which increases the height of the reels and the number of ways to win. You’ll also see stacked wilds and stacked higher value symbols when the Vortex reels are open. Open up all 5 Vortex reels at the same time to trigger the free spins which are played on a 3,125 ways to win reel set. It’s not the usual Halloween offering but the chilly theme and unusual extras make the Dark Vortex well worth a visit – especially as you can win 7,318 times your stake on every free spin! Play Wolf Hunters and Dark Vortex at Mr Smith Casino over the next few days and it could land you a cash bonus of up to £2,000. 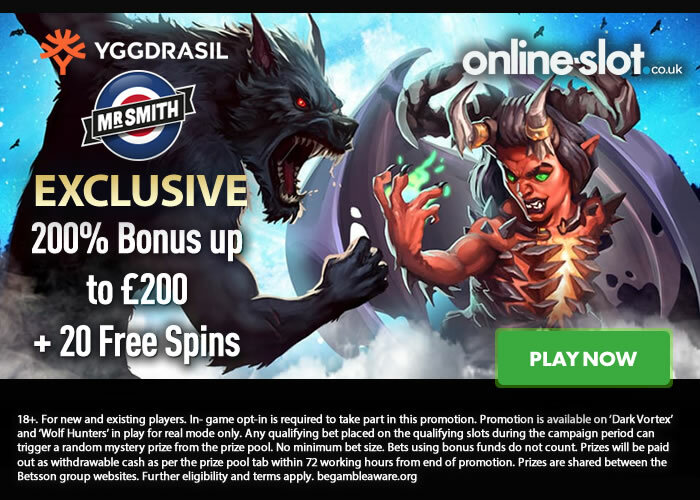 New players at Mr Smith Casino who deposit and wager £25, £100 or £200 will be eligible for a 25, 100 or 200 cash spins (free spins with no wagering requirements). This offer isn’t available if you deposit using Skrill, MoneyBookers or NETeller.